It is a tragedy of art history: Over the centuries, many of the elaborate, richly painted altarpieces that are pinnacles of Renaissance art were dismantled and dispersed, piecemeal, into public and private collections around the world. Some sections disappeared altogether. Records, if they existed, were lost. 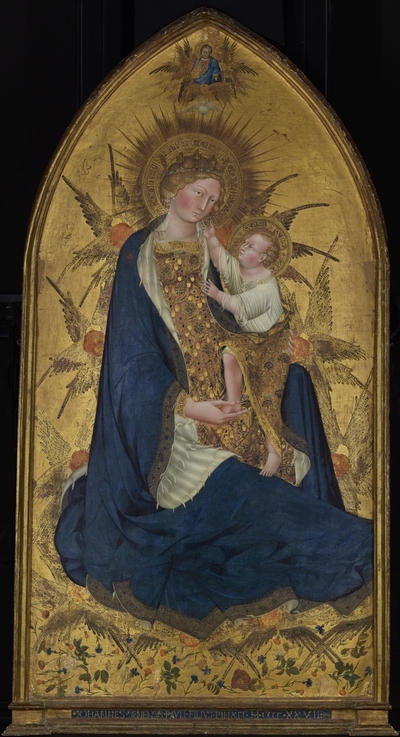 So it is a joyful occasion when museums put back together even some pieces of these glorious artworks, as the J. Paul Getty Museum has done in "Shimmer of Gold: Giovanni di Paolo in Renaissance Siena." The exhibition reunites five sections of the Branchini Altarpiece, a masterly work by Giovanni (c. 1399-1482), one of the most idiosyncratic and inventive artists of his time and place. Giovanni was a whimsical storyteller who cared less about rendering nature perfectly than about presenting the fruits of his fertile imagination, often unleashed in a hurricane of gold. His works can seem expressionist, even surreal. In 1936, when Alfred H. Barr, Jr., the first director of the Museum of Modern Art, mounted an exhibit called "Fantastic Art, Dada and Surrealism," he included Giovanni's "St. Nicholas of Tolentino Saving a Shipwreck" (1457) from the collection of the Philadelphia Museum of Art. The Branchini work (1427) is one of four altarpieces Giovanni created for the church of San Domenico in Siena, none of which are intact. It consisted of perhaps 11 panels. For some 500 years, though, only the central one—a Madonna and Child owned by the Norton Simon Museum in Pasadena, Calif.—was definitively identified. Then, in 2009, European scholars linked it with parts of the predella—the smaller, narrative panels at the bottom of an altarpiece—including the "Voyage of the Magi," owned by the Kröller-Muller Museum in the Netherlands. When both pieces came to the Getty for conservation, technical analysis reinforced that thesis, and "Shimmer of Gold" was born. The Getty was able to borrow three additional predella pieces from the Pinacoteca Nazionale in Siena (one is still missing, as are the central panel's wings). Fifteen other works by Giovanni and a few cohort artists complete the exhibition. The Madonna at the center of the show is a serene one, dressed in a deep blue cloak and red-and-gold brocaded gown decorated with flowers and acorns. She floats in a gold background, Christ on her knee, a bed of scattered roses, marigolds and cornflowers below. Jesus's resplendent cloak bears thistles, symbolizing the Passion and death he would endure. It's worn over a beautifully pleated white tunic. This duo is attended (or suspended?) by a host of sweet-faced seraphim. To add sparkle and create texture, Giovanni applied translucent paint over the gold and tooled parts of the surface. Above Mary's raised, jewel-encrusted crown, in her halo, he wrote "I painted this for you, Virgin. Protect this man." Imagine how this radiant picture, some of whose colors are now a bit faded, would have glittered in the candlelight of a chapel. Art historians believe that Giovanni drew inspiration for this piece from Gentile da Fabriano (c. 1370-1427), a popular artist from the Marche region who visited Siena in 1425 to take on commissions. Gentile was one of Italy's most technically sophisticated artists, and the exhibition includes his gleaming "The Coronation of the Virgin" (c. 1420) by way of illustration. It shows Gentile's skill for lavish, patterned, highly decorative works, though it is more static, more conventional, than Giovanni's images. Giovanni's distinctiveness is best on display here in the Branchini altarpiece's predella panels—scenes from Christ's life. In a crucifixion, he scratched away bits of a golden sky, allowing the red underpaint to show through in the form of flying angels. "Voyage of the Magi" also displays a golden sky, plus prancing horses and stylized trees. In "Flight to Egypt," gold serves as a structural element, not as decoration, forming mountainsides, rooftops, roads and riverbanks. Several features, like trees and a house, cast long shadows, while huge birds pierce a deep-blue sky. Each piece of the predella, from left to right, grows more complex in composition. Experts suspect that the altarpiece's missing wings depict saints. Yvonne Szafran, the Getty's senior conservator of paintings conservation and a co-curator of the exhibition, is studying two possible matches. She may reach a conclusion about one, of St. John the Baptist, by the end of the exhibition. 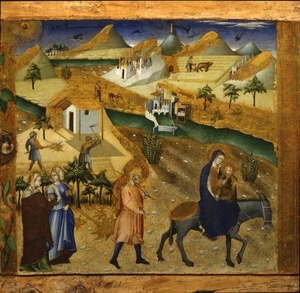 Giovanni had begun his career as a miniaturist, and the Getty exhibit includes several cuttings from illuminated books. They, too, illustrate his fondness for gold and his caprice. But one also shows why Giovanni was forgotten soon after his death. Particularly in his later years, he repeated himself. Thus, an image of God the Father in a small altarpiece here, "The Virgin and Child With Saints and the Annunciation" (1427-30), shows up again in an illuminated "A" from 1440. Fortunately for us, Bernard Berenson resurrected Giovanni in the early 20th century, inspiring such important collectors as Robert Lehman, Samuel H. Kress, and Andrew Mellon to buy his works. Now Davide Gasparotto, a senior paintings curator at the Getty, Bryan C. Keene, an assistant curator in the manuscripts department, and Ms. Szafran have rejuvenated him, too, with a small but splendid sampling of his oeuvre.